Home \ Blog \ Loans \ What is a Balloon Payment? Balloon payments are a non-traditional form of financing that involves little to no payments at the beginning of the loan’s term followed by a substantially larger lump sum payment due at the end of the loan’s term. Typically borrowers who want to use this type of financing must have great credit and be very trustworthy overall because of the loan’s intense payment structure. However, this doesn’t mean that balloon payments aren’t the right option for many consumers. As always, consider your current financial position and future financial goals when determining whether a balloon payment is right for you or not. Before making your decision, take the time to understand what balloon payment loans are, the corresponding advantages and disadvantages, and why they are considered riskier financial products compared to others on the market. How to find the best loan for your needs, click here. When an entire loan balance is due, it is known as a balloon payment. Usually, a balloon payment is a lump sum paid at the end of a loan’s term that is substantially bigger than the regular payments. Balloon payments occur when a loan is not amortized (learn more about amortization here). Instead, the borrower forgoes an expensive monthly payment in exchange for a larger payment at the end of the loan’s term. Generally speaking, the balloon payment is at least double the amount of a regular payment, but the final payment could be larger. Balloon payments can be risky for the borrower because there is a large lump sum payment due at the end of the term. More often than not, balloon payments are related to mortgages. That being said, sometimes balloon payments are also an option for business and auto loans. Finally, to qualify for a balloon payment structured loan, the applicants need to have good credit, ample cash on hand, and significantly high income. 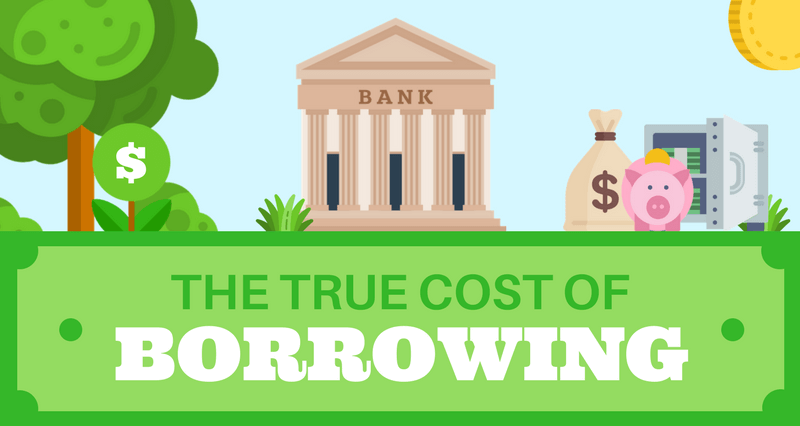 Do you know what the true cost of borrowing is? Check out this infographic to find out. Consider a loan worth $10,000 that is amortized for 10 years but is due and payable in 2 years. In this case, the borrower makes amortized payments based on the 10-year term but the balance will be due in 2 years instead of 10 years. This means there will be a balloon payment at the end of the 2 years. In the early stages of an amortized loan, the biggest portion of the payment is all interest. As the term of the loan moves forward, the payments are composed of less interest and more principal. By the end of the 2 years, the lump-sum amount due is pretty close to the principal, unpaid balance. Want to learn how to avoid being rejected for a loan? Click here. As with all forms of financing, there are related advantages and disadvantages. Typically, balloon payments are known to be one of the riskier financial products to use. Although, that doesn’t mean it isn’t right for some borrowers. Be sure to understand your financial situation and future goals before making a decision on whether or not balloon payments are right for you. Nominal or No Preliminary Payments. At the beginning of a balloon loan, the payments are very small or even non-existent. Affordable, Short-term Capital. Balloon loans are a fantastic, cheap way to finance something in the short-term given that you can meet the requirements of the payment structure. Higher Risk to the Borrower. Compared to traditional loans, there is more risk associated with balloon payments. The risk is attributable to the intense payment schedule. Expensive in the Long Run. The cost of balloon loans can be higher in the long term, despite the cheap cost in the short term. This is especially true if the loan is structured with interest-only payments. Difficult to Predict and Rely on Future Cash Flows. Even if you can predict your future cash flows, there is always a chance that the cash inflows won’t be what you anticipated. This could result in you defaulting on the loan. For everything you need to know about how bad credit affects your daily life, check this out. Why Can Balloon Payments be Risky? One of the most complex financial products on the market are balloon payment loans. For this reason, only eligible borrowers with stable income and significant cash on hand should use this kind of financing. Balloon payments are ideal for investors who want to free up capital or businesses that need financing immediately and have extremely reliable future cash inflows. Unfortunately, this means that balloon loans aren’t ideal for the average borrower. This is because, as an average borrower, it is challenging to predict whether or not your future income will grow substantially. Instead, it is safer to take out a loan that is affordable based on your current income since it is steady and reliable. If you like the structure of balloon payments, but can’t afford it, a wise alternative is to make a bigger down payment upfront. Of course, you’ll need to wait until you’ve saved enough money to make the down payment you want. If you’re not in a rush, this is an ideal option for the average borrower instead of using balloon payments. What is a loan origination fee? Check out this article to learn more. Are Balloon Payments Right for You? Everyone’s financial position is unique, one person may greatly benefit from a balloon payment loan structure while others may not benefit. Take the time to seriously consider your finances before making a decision. If you’re interested in being connected with a lender in your area, Loans Canada works with a wide variety of lenders and service providers to help get Canadian consumers the financing they need.